The first Art-In of 2012 is at the Colonel Wilkeson house at 771 Busti Avenue on Saturday, March 31 from 9:30am to 1pm. RSVP on Facebook here: https://www.facebook.com/events/257426147677667/. Make art on-site at the locally landmarked Wilkeson House at 771 Busti Avenue in the Prospect Hill neighborhood near the Peace Bridge. Demolition of the building by the Buffalo and Fort Erie Public Bridge Authority (PBA), in defiance of its landmark status, is imminent.... All seven homes on Busti owned by the PBA since 1995, including the 1863 Col. S. H. Wilkeson house, will be demolished for an expanded truck plaza, and adjacent 12 acre Duty Free Store. The Columbus Park neighborhood inside of the Prospect Hill Historic District, has been fighting for 23 years to hold the line because 4,000 diesel trucks a day already pass by their homes. Environmental and health concerns impacting more than 22,000 West Side residents have been linked directly to the toxins in diesel exhaust. The PBA doesn’t deny polluting the air but uses their bi-national status to protect themselves against most levels of government accountability. Without accountability, the PBA continues to wreck lives and neighborhoods. The PBA is tax exempt so it internalizes all the revenue it generates. But tax-payers will fund their expanded facilities including the new Duty Free Store while Prospect Hill pays with the market value of their homes, their quality of life and their health. More about the demolition plans: http://www.buffalorising.com/2012/03/pbas-busti-properties-move-em-or-theyll-remove-em.html. Connect with the neighborhood: https://www.facebook.com/homesnearthepeacebridge and http://www.movetheplaza.com/currentmap.html. See a great documentary here: http://vimeo.com/34624466. By coming to this event you will join artists and preservationists to support a strong-minded community in their right to shape their own space. Artists of all media and skill are welcome, as are onlookers and others who want to share their stories of the space. We regularly have sketchers, painters, photographers and print-makers. Please bring your own materials or just come to watch the artists and enjoy the building. Painting for Preservation gathers at distressed and endangered historic places to bring creative attention and admiration to them. 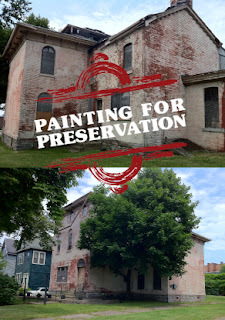 For more information, see; http://www.paintingforpreservation.org/ or contact Sara at info@paintingforpreservation.org. Art contains within it the possibility to change perceptions. With Painting for Preservation, the art is both the collaboration and onsite presence of voices at an endangered location along with the creation of individual artworks inspired by the experience. Painting for Preservation works in collaboration with many local organizations and grassroots efforts to stop needless demolitions, demo-by-neglect, and promote preservation. We support the Columbus Park/Prospect Hill Neighborhood and the Buffalo West Side Environmental Defense Fund, and all their activists/volunteers/supporters. Learn more about the Peace Bridge neighborhood here from the following short documentary created with assistance from Squeaky Wheel. House artwork is not just getting your house coloured. It contributes sparkle to your house and environment. Shades used for house artwork leave a deep impact and makes the environment of the property accordingly. And thus bright and cool colors are preferable.